Do you remember my last post about three different breakfast dreams for chocolate lovers that are easy to make? Well, today I am happy to share the three other promised breakfast dreams with you that are maybe not that easy so make, but instead, super(food) special and a really healthy way to give your tastebuds a loving hug. 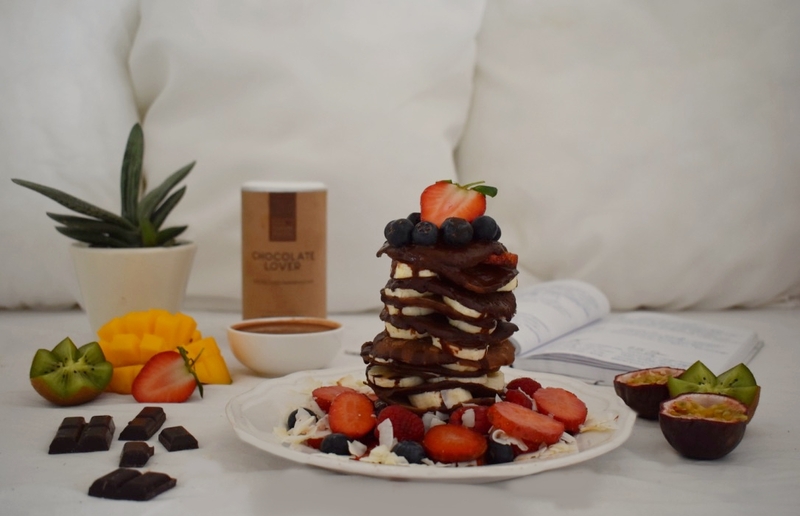 These chocolate lovers breakfast dreams take a little bit more time to prepare than simply having the chocolate superfood milkshake straight out of your blender or munching on some chocolate energy bars for breakfast. They are just perfect for slow and mindful mornings when you want to take some more time to treat your chocolate loving self the right way. 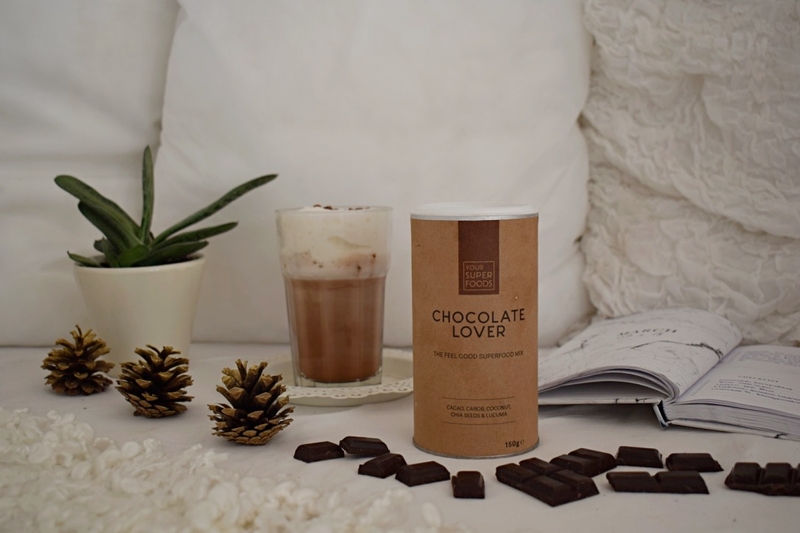 As already mentioned in the post before, the ‘chocolate lover’ superfood mixture by Yoursuperfoods took all these chocolate breakfast dreams to the next level and added that little bit of extra health to my chocolate mornings. But no need to worry if you don’t have the health boosting superfood mixture in your cupboard yet, these slow and mindful breakfast dreams will also turn out super awesome if you replace the mixture with a delicious and fair-trade cacao powder. 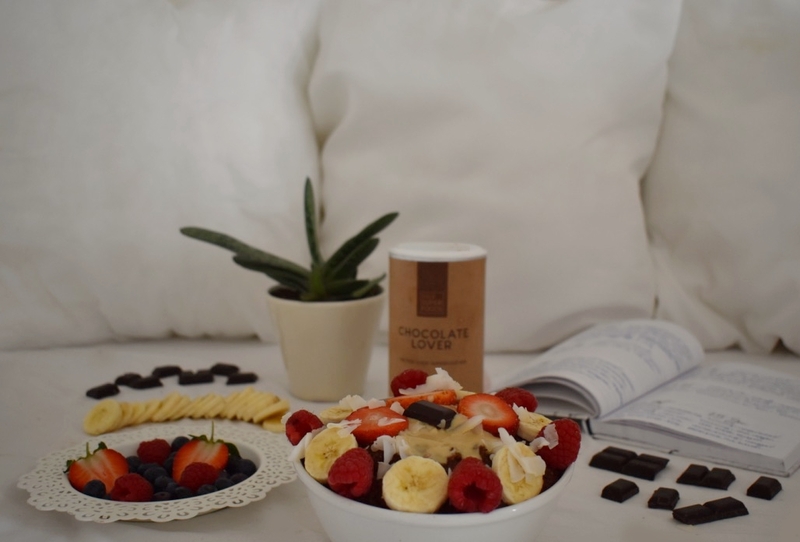 Are you ready for your next chocolate lovers breakfast dream to enjoy with the hot superfood chocolate you can see on the picture below (you maybe already know them out of the post before)? I definitely am! Yes, lets start with a cake today. This chocolate cake is full of nutrients and perfect to make if you invite your friends for a Sunday brunch to your house you want them to never forget. With the support of raw and healthy nuts, dates and sweet potatoes, this cake becomes a perfectly healthy breakfast idea that provides your body with nutrients it deserves. Also, you still don’t have to spend hours in the kitchen, it took me not even 30 minutes to create that chocolate lover goodness – you don’t even need an oven. For the base you simply have to blend all of the dates. After that you shred the nuts in your mixer and add the dry cacao powder and your superfood mix to the nuts. Then it’s a little workout for you to knead the dry ingredients with the blended dates. It seems impossible at first but don’t give up! If you knead with all of your strength it will turn out as the perfect chocolate cake ground. Adding water won’t be needed to press the mixture into your favorite cake tin. For the filling you create a puree out of your cooked sweet potatoes and simply add all of the other ingredients except the agar agar into it until your tastebuds are satisfied with the result. Then you put the cake filling into your favorite cooking pot (only the best for that chocolate brunch cake you know) and let it cook for two minutes. Add these magical 10-20 grams of magical agar agar while stiring like crazy with a spoon to prevent the mixture from burning. Then simply add that delicious filling on top of the cake ground and let the agar agar do the magic for you. You already can add the special topping on to the cake than. I decided to choose strawberries, blueberries, coconut chips and my beloved coconut butter – yum. What would you choose? Since I am fourteen I love eating oatmeal almost every single day. With the support of the chocolate lover Superfood mix I am now able to even create some kind of special brownie out of my regular oatmeal bowl. And the best thing about it is definitely the hidden surprise for myself (haha I am still exited every time) underneath the brownie dough: Melted frozen berries and a delicious chocolate sauce to enjoy with the topping and and the oatmeal brownie dough. Of course it is a little bit more time consuming then simply mixing something together in your blender – but also it is definitely worth these few, mindful extra minutes, am I right? At first you simply add the frozen berry as the hidden surprise, as well as your chocolate sauce out of mashed medjoul dates, your favorite plantmylk and cacao powder into your empty bowl. Then cook the oats with ricemylk, one mashed banana and a pinch of salt for the taste. Simply that combination is already so delicious that I could happily live of it. 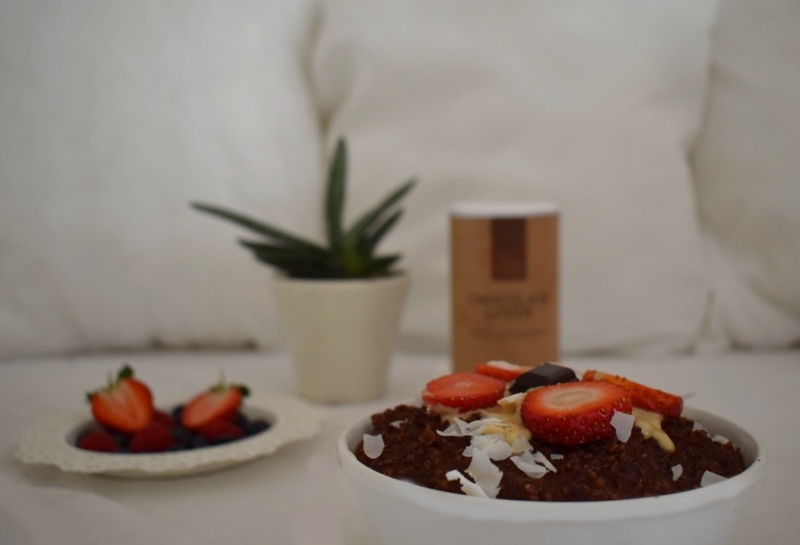 But today we decided to make a brownie out of it by adding in one tablespoon of the ‘chocolate lover’ Superfood’ mixture. I decided to even add that extra chocolate and crunchy fun by adding one tablespoon of cacao nibs into the cooking oatmeal brownie. Who doesn’t love the combination of creamy and crunchy goodness? After cooking the oatmeal brownie for five minutes, fill everything into your favorite bowl on top of the already prepared surprise. Then it’s your turn to become your most creative self when it comes to the toppings. Add on everything you can find in your kitchen on top of your brownie oatmeal that your heart desires. I usually love to add a banana, blueberries, kiwifruits, peanut butter, nuts and some dried fruit.. the options are endless, veganism is not boring at all, enjoy! I personally always was a huge pancake lover and I was so happy when I realized that there are existing vegan pancakes without eggs on our planet that not only are better for your body, but are also super delicious and you can even get super creative by experiencing with the weirdest combinations. I never imagined that all these different ingredients could even stick together in a pan. Actually, the picture doesn’t even let you know the truth: These are not only the regular kind of chocolate pancakes for chocolate lovers. There are hidden two different kinds of pancakes: The lighter mylk chocolate variation and the dark chocolate version. By creating these two different pancake variations, a chocolate lovers pancake morning becomes even a little bit more exiting. Your chocolate loving tastebuds will thank you. It’s your task to blend all the ingredients for the mylk chocolate dough with your blender. Then fill half of the mixture into another bowl and add on one extra big tablespoon of cacao powder to create the dough for the dark chocolate pancakes. If you like to enjoy a little bit more pancakes, don’t do that! Simply add all the ingredients for your dark chocolate dough into your blender. Then you end up with the double amount of pancakes – yum. Form the little pancakes in your favorite pan on medium heat. Don’t be shy to experiment with the consistency. Maybe they will stick together in a perfect way if you add a little bit more flour. Maybe you will reach that perfect, fluffy consistency by adding a tiny bit of water. If you are a multi-tasking talent you probably even can create the chocolate sauce for the pancakes out of mashed dates or sweetener, plantmylk and cacao powder while the pancakes are heating up in your pan. I love adding little banana pieces in-between my pancakes to create an even bigger pancake tower. I also am convinced by the idea of bananas and chocolate being the perfect combination. On top of the pancake tower I poured the chocolate sauce and decorated that double chocolate breakfast dreams with blueberries, strawberries, raspberries and some coconut chips. While enjoying every single one of them after I took the pictures I added a whole lot of cashew butter and coconut butter. It simply is the perfect combination to chocolate flavored pancakes. What is your favorite nut butter to enjoy your own double chocolate superfood pancakes with? I can proudly say that I even have a pumpkin seed butter chilling around in my cupboard. Yummy! Sieht sooo lecker aus! Danke für die Rezepte! Sieht echt lecker aus! Tolle Rezepte…muss ich ausprobieren! Oh Gott ich bekomme grad so einen Hungerflash! Brownie Oatmeal wie geil! Super Inspiration! Also die Pancakes sehen schon echt verdammt gut aus! Wow. super leckere Rezepte! Ich bin leider gar kein Frühstücksmensch, muss ich mir unbedingt angewöhnen, deine Rezepte klingen so gut! !